You’ll be happy to know that I have fully dedicated myself to scaling down all the cake recipes into ramekins to serve two. This chocolate cake for two version was easy, and the lemon cake for two was super fun (because lemon is my favorite flavor!). I followed those with funfetti cake for two, and I’m just going to keep going. I hope you won’t mind. We all have those ramekins in our cabinet that we think are only good for creme brulee. While they are so very good for creme brulee, we can do better. Even though lemon creme brulee is my favorite, we can enjoy so many more desserts in ramekins…like small portions of cake! If you were unfamiliar with my life calling, it’s this: baking small desserts so you can bake and eat dessert every day. It’s a sweet life, you should join me. I should let you know that these cakes are good on their own, without frosting, but if you’re going to take the extra minute to stir together the frosting, grab the sprinkles, too. 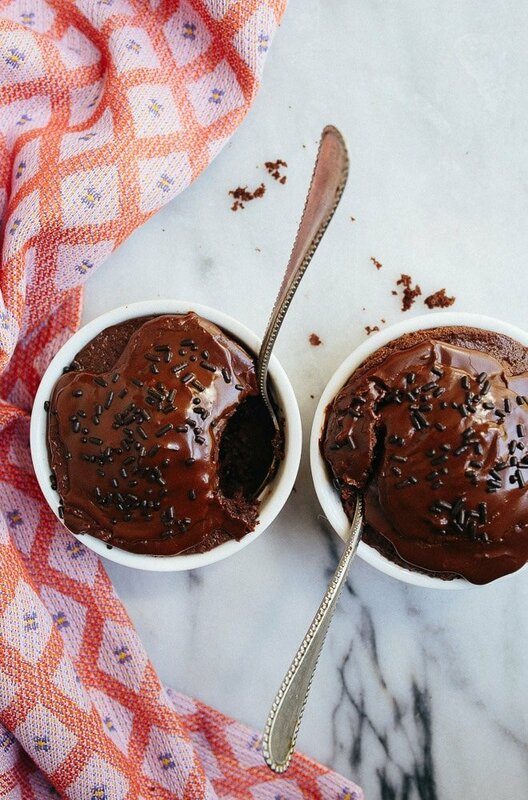 You should also know that there’s absolutely no shame in eating both ramekins of chocolate cake for two yourself. When I was in the testing phase of this recipe, the first time I finally nailed it, I ate both ramekins. Then, I strapped the baby into her stroller to walk it off, and let me tell you: chocolate cake will seriously fuel your work-out. I use a small amount of coffee in this cake (because coffee and chocolate love each other forever), and I like to think the caffeine gave me a work-out boost. Basically, I’m in the running to become a life coach: eat cake, work out, repeat. I like to think these little chocolate cakes in ramekins will be there for you in your time of chocolate need. -These are the exact ramekins I use. -This mini baking sheet is helpful, as I don’t recommend placing the ramekins directly on oven racks. 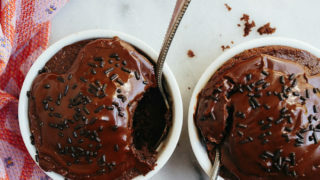 Small chocolate cake for two people baked in two ramekins. In a small bowl, whisk together the sugar, flour, cocoa powder, baking powder, baking soda, and pinch of salt. Set aside. In a medium bowl, whisk together the egg yolk, milk, oil, vanilla, and coffee (or water). While the cakes cool, make the frosting: whisk together all ingredients, adding more coffee or milk to thin it out to a pourable consistency. Sprinkles! 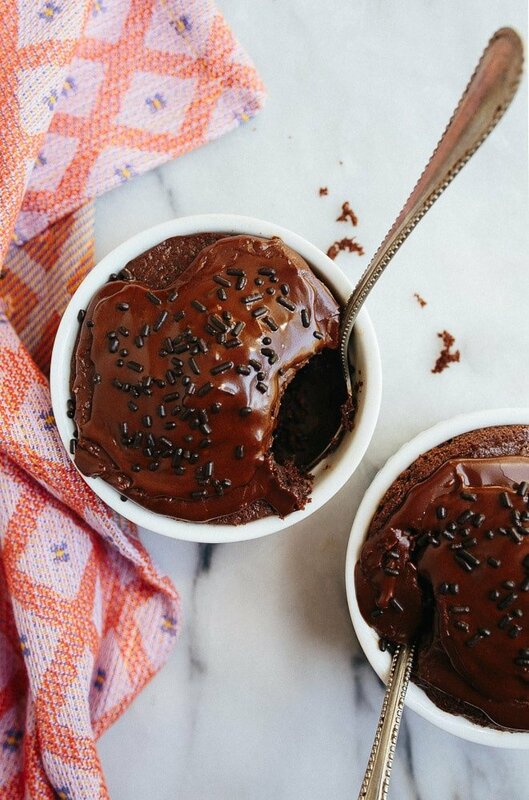 Oh, how many nights have a longed for just enough of a dessert to not have any left over. LOVE THIS. This looks and sounds perfect! This, is a beautiful thing. I love the addition of coffee. Perfect use for that little swirl of coffee that’s always left at the bottom of the pot. I am currently eating my cake with a glass of red wine and I am in heaven!! This was so quick, simple, and delicious! 10/10 will be making again and again!! Your idea sounds wonderful. Think I’ll do the same. Thanks for the post. Excellent… I have been hunting down desserts for my ramekins.. I made your brownies two weekends ago and made these for a sweet treat the other night and they were delicious! So nice for the husband and I to each have a little cake and not have a ton of leftovers – perfect! Thanks for another great recipe! I just made these tonight – super yummy. The sprinkles were a nice touch! I’m also not seeing the link for your favorite ramekins. Can you update the post? The link to your ramekins isn’t live. I’m excited to try it! “Eat cake, work out, repeat” is totally my life’s motto. Before when I’ve said it, it sounds more like, “go for a run, eat cookies.” But it’s the same principle. I need these little cakes in my life!! You’re my favorite. Thrilled to find this recipe! The link for the ramekins doesn’t work though. What size are we looking at? Oh my gosh…I made these little delights last evening and I had to log this morning on to leave a comment. I was in heaven eating my little cake. It was perfectly delicious and perfectly sized. Somehow, it is different than a cupcake…perhaps a bit more dense, a bit more decadent…not sure but I can’t wait to polish of the second one later today. Looking forward to all the future variations…especially a funetti cake for two. Oh, bless you Christina for this recipe! I love everything about the idea of chocolate cakes in ramekins. Little, personalized chocolate cakes. SO much love! So next time I may wait for the cake to cool and actually put frosting on. No matter. Bailey’s works fine as an accompaniment. Such a great go to recipe! Hi, These look delicious, can’t wait to make them. One inconsistency: your recipe calls for two 6 ounce ramekins, but the Amazon link to “the exact ramekins” you use, leads to 4 ounce ramekins. Which size is correct? Thanks, beautiful blog. Alike, it will be amazing! A cacao will give taste of chocolate, coffee – sensuality. I’ve made these twice…delicious! My ramekins were larger (8oz?) but the cakes still came out beautifully…left room on top for a scoop of vanilla ice cream after a quick dusting of powdered shower instead of the frosting! FYI: the link for the ramekins are for the 4oz size not 6oz (same with the link on funfetti ramekin cake). This is my new favorite dessert. These are perfect to make fresh any time I have a sweet tooth (which has been every night since discovering this recipe). I love how simple and perfect they are. My Cakes ended up super dry. Neither hubby or I could finish, it was super chalky ???? It sounded like you over-baked. And how is your oven temperature?–calibrated? Can i use a whole egg instead of just the yolk? No. The recipe will fail. The recipe was created to make the perfect chocolate cake for two. If you change the ingredients, it will change the results. OMG I can make this sugar free whoo hoo great for diabetics who are craving a sweet treat. How did you make this sugar free? I’d love to reduce the sugar, too! This recipe calls for two 6 ounce ramekins, but the Amazon link to “the exact ramekins” you use, leads to 4 ounce ramekins. The same inconsistency is in the funfetti and lemon cakes too. 6 ounce, sorry! amazon keeps changing this on me! I have made this recipe twice. The first time I made it as written using hot water in place of coffee and milk to thin the frosting. The cakes turned out great however, I didn’t love the bitter taste due to the amount of cocoa. The second time, I repeated what I did the first time but I reduced the cocoa to 1 1/4 TBSP in the cake and 1/2 TBSP in the frosting. I liked the taste so much better! The texture of the cake was still good/cake like but the middle of the cake sunk. I realize that recipe results can change when you make adjustments but wondered if you have any suggestions that might make the middle not sink. I used Hershey’s unsweetened cocoa…not sure if there is a different cocoa that would taste less bitter?? Thanks for the recipe though. It’s so nice to make small quantities and have a piece of warm chocolate cake! Looking forward to trying more of your recipes. Thanks so much, Sharee! I’m sorry the regular amount of cocoa powder tasted bitter to you :( I’m glad the reducing it slightly made the cake perfect to your taste, though! Thanks! I’ll try that adjustment. I made your Chocolate Cake for Two for Valentine’s Day because my husband loves chocolate and I love portion control (maintaining wt after losing lbs last year). Your recipe was a hit on both counts and delish plus easy peasy to throw together. Thank you! Just made these and they were Amazing! Came out absolutely perfect from the oven! This recipe is definitely getting bookmarked! :) thank u Christina! These were really easy to make and really tasty! The only thing is that I almost immediately regretted eating an entire one. I felt sick for about an hour before it dawned on me. WAAAAAAAY too much sugar to eat at one time. I do blame myself, as I didn’t even think about the fact that I ate 1/8 of a cup of sugar in one sitting (plus all the sugar from the frosting. Made these tonight and they were so simple! On pointe texture with a perfect, moist, crumb and well balanced chocolate flavour. I put a little raspberry flavouring in one but I think there would be so many possibilities for various boozy additions too! Thank you so much for this little delight! I don’t have ramekins. Can I use a 6” cake pan? I loved this recipe. They liked it so much here at home too. Just Made the cake, it’s currently in the oven, tasted the batter and mmm! Sooo delicious! Made these tonight for a little day-after-Valentine’s-Day-treat in my heart shaped ramekins and they were great!! Super precious with red sprinkles and perfect with a little glass (or 2?) of port. 😊 Thanks for making these small-batch recipes!! !